Oh, dear. I have begun crafting. I put it off until I reached level 20 with my main, and truth be told it's just as well. I've never yet sold or traded away any of the crafting materials I've come across (though I should really put the ones I can't use into the guild bank), and I still ran out remarkably quickly. Ah, well. One basic set of armor that I didn't need, and a couple of eight-slot bags that I did, and it was back into the field with me to acquire more leather and jute. Why couldn't I have picked a crafting discipline that relies on easily-mined metals or readily-chopped trees? Silly me. Still, half a decade as an Assassin-Tailor in EverQuest II seems to have prepared me remarkably well for putting in time as a Thief-Leatherworker in Guild Wars 2. 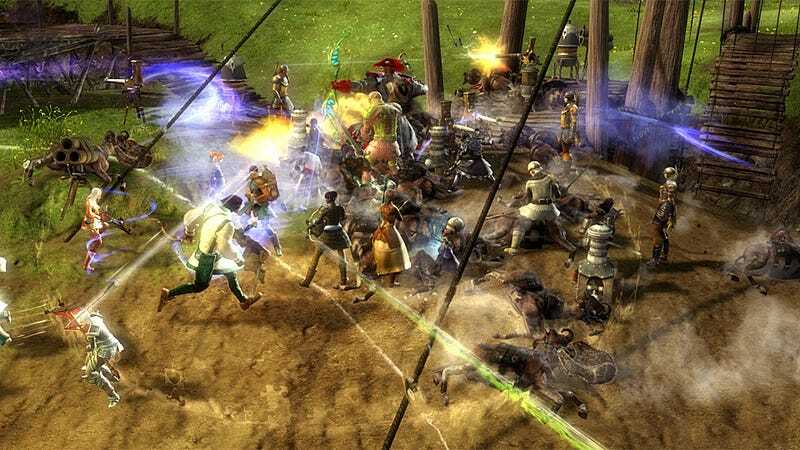 In fact, a lot of what I see in GW2 reminds me, pleasantly, of a more streamlined version of EQII. "Streamlined," though, is the operative word. The "Discoveries" tab is a great addition to crafting, but I'm a particular fan of the "craft all" button that lets a player refine a huge stack of stuff into a smaller stack of more usable stuff almost instantly. That, right there, is a fantastic feature that makes crafting feel almost fun, rather than punishing like I'm used to it being from other games. I really needed a crafting break for a while too, because group events on the overland maps had been wearing me down. It's one thing to zone from a safe spot in the overflow to the middle of a melee on the "real" server when there are plenty of players at hand. Suddenly to find yourself alone, surrounded by an event appropriate for 5-15 players? I'd like to say that at least I made my deaths count, but I really didn't. Two dozen level 24+ monsters, to one level 19 me? It feels profoundly unfair, and while the penalties for death are at least minimal, I began deeply to resent the incessant, repeated events that made up the war between the Seraph and the centaurs in the Kessex Hills. I do now wish that the first available dungeon zone were at level 20 or 25, instead of level 30. While I've settled into a groove that gains me about two levels per day, it's a groove that's in danger of becoming a rut. Exploring the world still motivates me—particularly now that I've been able to walk from my starting area, through a higher-level area, to other races' starting areas—but when a map's uncovered, it's uncovered. At least the maps I'm uncovering remain beautiful, though, and fun to explore. And once a character hits 20 and has amassed some weapons expertise, skill points, and skill slots, playing a class really starts to come into its own. The ability to swap out my preferred pistol/dagger weapon set for a bow at pretty much any time is enormously useful, particularly when I find myself standing in the midst of a massive event, with attackers drawing in from all sides. Kotaku's MMO reviews are a multi-part process. Rather than deliver day one reviews based on beta gameplay, we play the game for four weeks before issuing our final verdict. Once a week, we deliver a log detailing when and how we played the game. We believe this gives readers a frame of reference for the final review. Since MMO titles support many different types of play, readers can compare our experiences to theirs to determine what the review means to them. Catch up with log one and log two.